Periodontal disease (also referred to as gum disease) is the leading cause of tooth loss among American adults, as well as one of the most common health problems throughout the world. 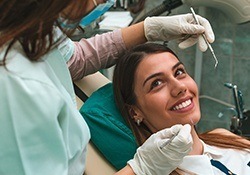 This infection may seem relatively harmless in the beginning stages, but receiving treatment early is absolutely vital if you want to protect your smile from lasting damage. At Atrium Family Dental, Dr. Albert, Dr. Stylski, and Dr. Snow offer several non-invasive gum disease treatment options for banishing dangerous bacteria and revitalizing oral health. Have you noticed any bleeding in your saliva after flossing? Does your gum tissue seem overly red or swollen? Please don’t wait – contact our New Lenox, IL dental office today to schedule a checkup. Why Choose Us for Periodontal Therapy? Scaling and root planing is essentially a professional cleaning that has been elevated to the next level. Our hygienists will perform treatment in two distinct segments, starting with the thorough elimination of plaque and tartar from around and underneath the natural gum line. Once this is complete, any rough spots along the tooth root surfaces will be gradually smoothed down as well to prevent further bacterial buildup. Depending on the severity of the patient’s symptoms, this treatment may require multiple appointments to successfully complete here in New Lenox. Antibiotic therapy can often be an excellent supplement to scaling and root planing or soft tissue laser therapy. The medication will be directly placed in specific sites throughout the mouth, eliminating remaining bacteria over a period of days or weeks following the initial treatment. 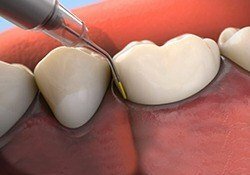 Studies have found that antibiotics can reduce the size of deep periodontal pockets, helping many patients avoid more invasive treatment down the road. 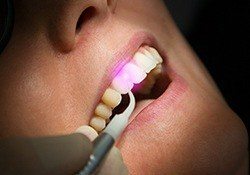 If gum disease has caused more moderate damage to a patient’s oral health, soft tissue laser therapy is a highly comfortable and precise way to eliminate diseased tissue from the mouth. This technology’s focused beam provides instant sterilization, and any post-operative symptoms like bleeding or swelling are minimized to almost nothing at all. Most patients feel so comfortable and at ease throughout the treatment experience that they don’t even need local anesthetic!